Our city has so many hidden histories, lost to us when the communities that lived and loved in certain neighborhoods move away – or are forced away by what seems to be Chicago’s implacable gentrification process. Some of that history resides in memories attached to specific spaces where immigrant communities lived transcendental moments. The La Havana Madrid Nightclub, originally located on Belmont and Sheffield, was exactly such a space. Luis “Witto” Aloma, a Cuban-born Chicago White Sox player, opened La Havana Madrid in the sixties, and as such, it was open for about 10 tumultuous years in world hisory. Today, the same second floor space is occupied by Milio’s Hair Studio. Teatro Vista’s Sandra Delgado has created a magical story situated in La Havana Madrid’s dancefloor. 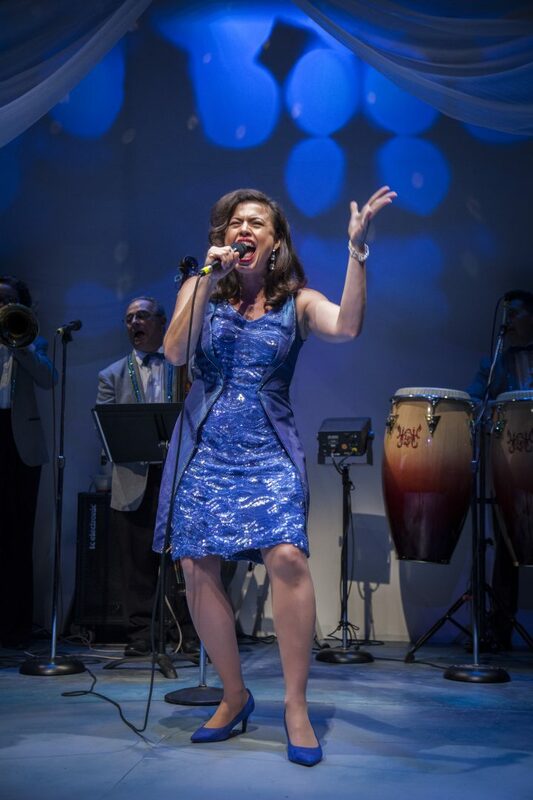 Delgado co-stars in La Havana Madrid and appears as a singer (backed by beloved Colombian-American musician Roberto ”Carpacho” Marin and his band of 30 years, Carpacho y Su Super Combo) who tells and sings about the lives of Colombian, Cuban and Puerto Rican immigrants who shared rhythms on La Havana Madrid’s dancefloor. All of the stories in the play are based on real life experiences. In fact, Delgado’s history with Marin is a uniquely personal one. The musician knew Delgado’s father from casual encounters in musical environments in Medellin, Colombia only to meet up with him again in Chicago when rehearsing music at a friend’s basement. Delgado folds Marin’s story into a tale that includes the stories of several other real Chicagoans. These include Cuba’s “Peter Pans” (the controversial program that airlifted more than 14,000 unaccompanied minors to the U.S. to avoid Fidel Castro’s Cuban government), the story of Delgado’s own parents, the experiences of Chicago’s Puerto Rican activists and the Puerto Rican Parade Committee’s beauty pageant first queen, Myrna Salazar – and even events such as the Division Street Riots all come alive in the songs and music of La Havana Madrid.